This page notes details of Naturia Hydrangea (EARTH/Plant/Effect Monster) : decks, tips, effect and rulings. Learn and enjoy playing Yu-Gi-Oh! Duel Links! If the effect of a "Naturia" monster you control was activated during this turn, you can Special Summon this card from your hand. Stats is good as long as you special summon it by its effect. It can only be special summoned when your Naturia monster's effect activates. Stats is not that good if you summon it via tribute summon. 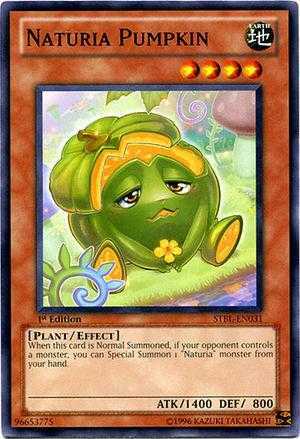 Summon Naturia Pumpkin when your opponent has a monster in the field, its effect will activate which lets you summon a Naturia monster from your hand. You can then Special Summon Naturia Stag Beetle since it has a pretty good attack when special summoned and it has a good effect. Due to the activation of Naturia Pumpkin's effect, Naturia Hydrangea's effect activates which is you can Special Summon it from your hand. This makes you have 3 monsters in the field in 1 turn. I summoned naturia beetle, opponent took his turn, then on my turn (during main phase), I activated Super Rush, which activated beetle’s effect, switching his attack and defense. I was not able to special summon hydrangea. I do not understand why it wouldn’t let me special summon. It was on my turn, it was before battle phase, and it was a naturia’s activated effect. This card is definitely bugged. I think they may have it programmed to only be special summoned when a naturia is summoned and then it’s effect is activated on that same turn before battle phase. 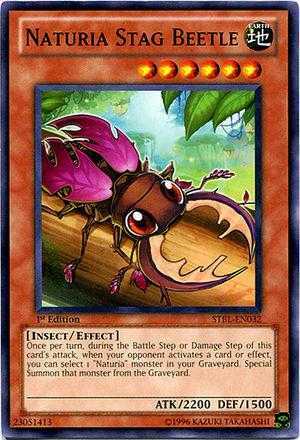 So maybe summon nature’s beetle, play super rush, then special summon will work. Will have to play around with it. But can you summon this in the enemy turn?because nat strawberry and guardian effect activated by the enemy summoning something. It can only SS'd on your turn. Apparently, you cannot SS this with pineapple effect (return from graveyard) or stag beetle's effect (enemy activate card/effect). Probably the reason is Hydrangea only can be SS by its effect during YOUR MAIN TURN. when Naturia Stag Beetle's effect was activated i couldnt special summon Naturia Hydrangea. Is it a glitch or Naturia Hydrangea's effect will only work before battle phase? It work before battle phase. Its effect is not triggered by Naturia effect but is a condition itself. If it said "If the effect of a "Naturia" monster you control was activated during this turn, Special Summon this card from your hand", then you can trigger its effect to Special summon itself, similar to Kidmodo Dragon.